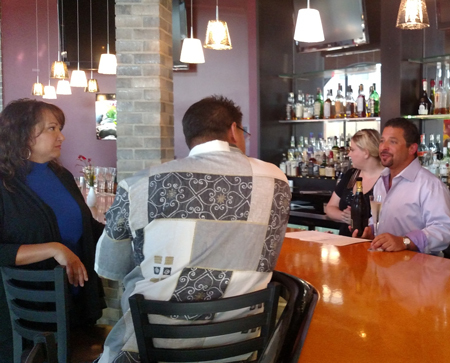 Jonathan Lutz welcomes guests to the dinner last Thursday at Uptown Kitchen. 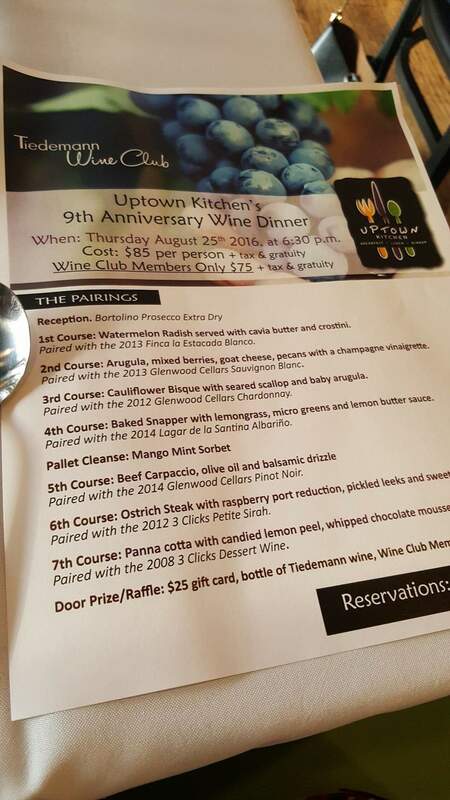 Last Thursday evening I had the pleasure of participating in Uptown Kitchen’s 9th Anniversary Wine Dinner celebration. My special treat was selecting all the wines for the evening and making sure they paired well with the menu. Jonathan Lutz, a close personal friend and owner/proprietor of Uptown Kitchen, has spent his entire professional career in the restaurant business. Growing up in Chicago, Jonathan started learning his culinary skills early by cooking with his mother at the age of 7. After graduating from the University of Texas at Austin, Lutz returned to Chicago and entered the restaurant business. For the next 20-plus years he worked at and managed such Chicago-landmark restaurants as The Pump Room and Shaw’s Crab House. Jonathan attempted to open his own restaurant in Chicago but just could not get comfortable with the situation and decided (heeding his father’s advice) to not force the deal to work and ended negotiations and moved on. Those of us who frequent Uptown Kitchen are certainly glad he did. 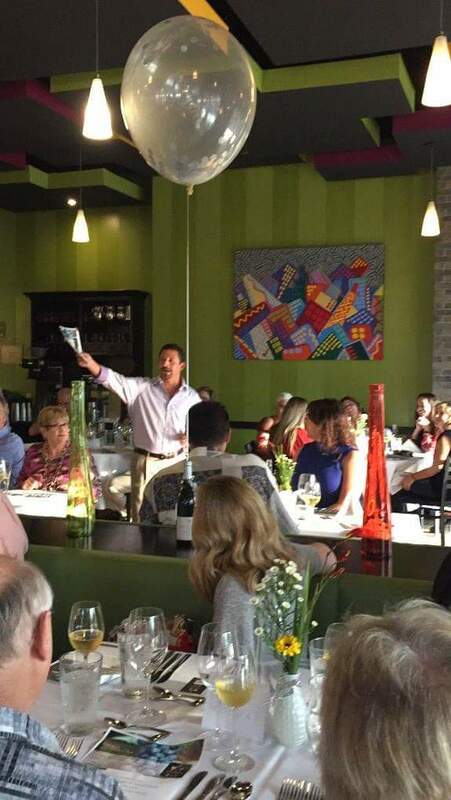 It was a great turn-out for the 9th Anniversary Wine Dinner at Uptown Kitchen. In 2002 Jonathan and his charming wife Jenny made the decision to move to South Bend in hopes of opening a restaurant here. Jonathan spent a few years doing odd jobs, and all the while learning the market and searching for the right location for his restaurant. 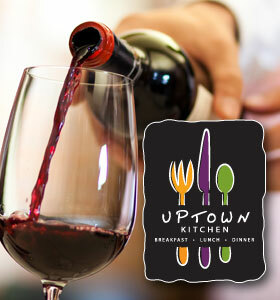 After years of market research Uptown Kitchen opened on August 1, 2007, in Toscana Park. Uptown remained in that location until it moved to its current and expanded location in Heritage Square in February of 2010. Uptown Kitchen owner Jonathan Lutz pours Prosecco for James and Tonya Yoder of Elkhart at the dinner. 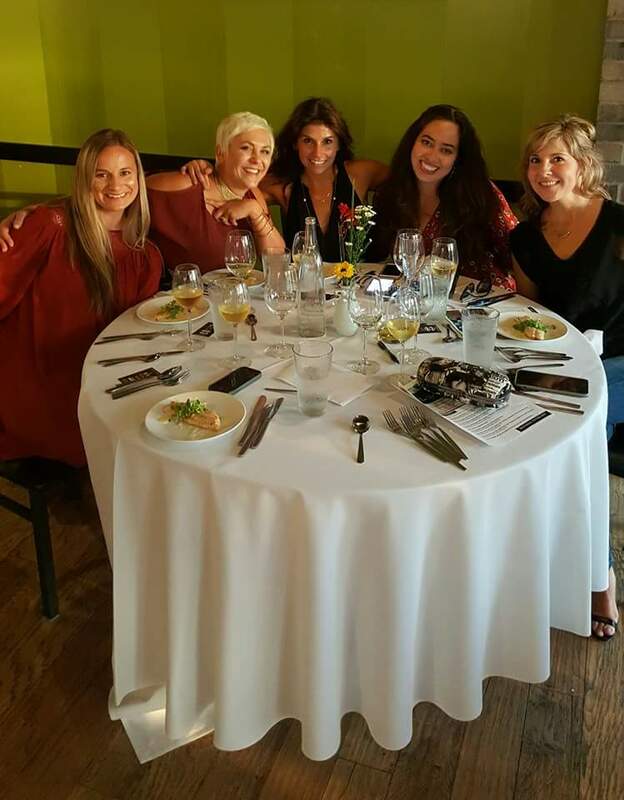 Thursday’s dinner was a celebration of 9 years in business for Uptown Kitchen. It started with glasses of bubbly Prosecco for the evening’s 40-plus guests at the kick-off reception. Around 7 pm everyone took their seats and Jonathan welcomed them to the 9th Anniversary Wine Dinner. What followed, for the next several hours, were seven delicious plates of food and different wines … all perfectly paired with the food. 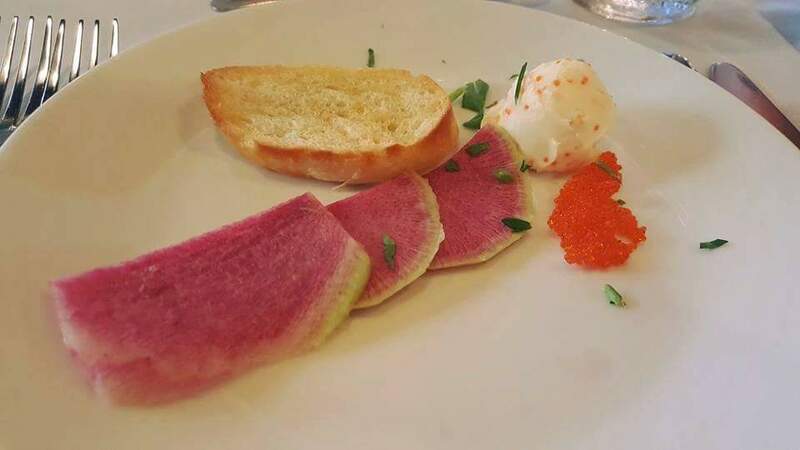 Watermelon radish served with cavia butter and crostini. 1st Course: Watermelon radish served with cavia butter and crostini. Paired with the 2013 Finca la Estacada Blanco. 2nd Course: Arugula, mixed berries, goat cheese, pecans with a champagne vinaigrette. Paired with the 2013 Glenwood Cellars Sauvignon Blanc. 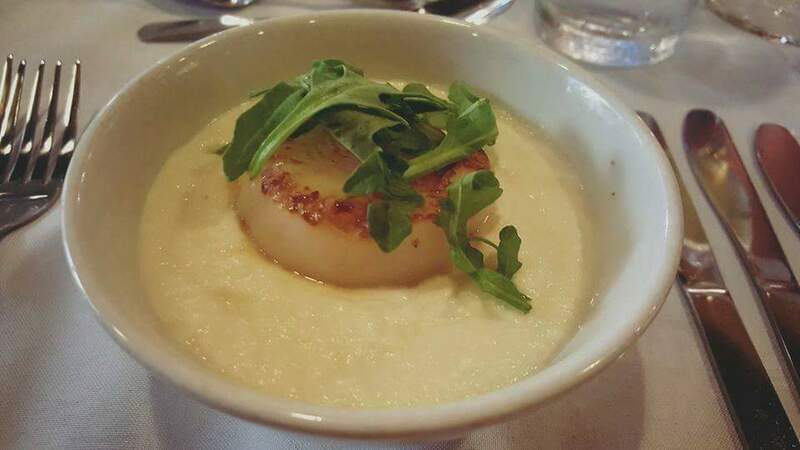 Cauliflower bisque with seared scallop and baby arugula was the third course of the evening. 3rd Course: Cauliflower bisque with seared scallop and baby arugula. Paired with the 2012 Glenwood Cellars Chardonnay. 4th Course: Baked snapper with lemongrass, micro greens and lemon butter sauce. Paired with the 2014 Lagar de la Santina Albariño. 5th Course: Beef carpaccio, olive oil and balsamic drizzle. Paired with the 2014 Glenwood Cellars Pinot Noir. 6th Course: Ostrich steak with raspberry port reduction, pickled leeks and sweet potato mash. Paired with the 2012 3 Clicks Petite Sirah. 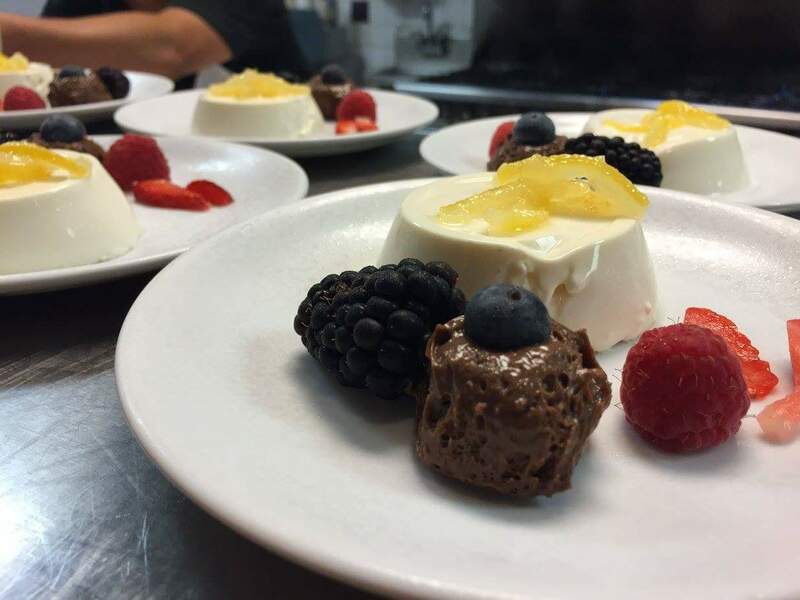 Dessert: Panna cotta with candied lemon peel, whipped chocolate mousse and fresh berries. 7th Course: Panna cotta with candied lemon peel, whipped chocolate mousse and fresh berries. Paired with the 2008 3 Clicks Dessert Wine. Frankly I think this is one of the better wine events we have had at Uptown Kitchen. The chef and his team did a great job. The food was good and served at an acceptable temperature (often hard to accomplish for large groups). 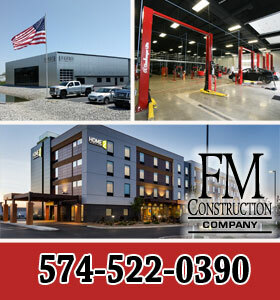 The service was outstanding and the turn-out was good. It was a really enjoyable evening. 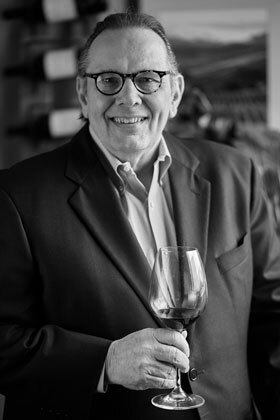 Thanks, Carl, for your continued support, friendship and delicious wines. I am already looking forward to our next wine dinner. In the meantime, we plan to promote some more casual events, with wine, cocktails and small food tastings. Should be fun!